If you haven’t noticed, I’m on a major beading binge. And after treating myself to some new colors at a 40 percent off sale at my local craft store, my need to bead seems to have kicked into overdrive. I just can’t seem to get enough of those pretty little beads. This week I whipped up some dainty necklaces inspired by the vintage necklace I inherited from my Grammy B. 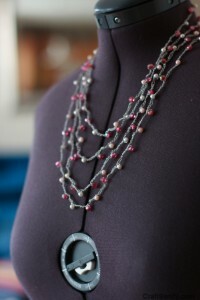 The necklace is super long and fun the wrap around several times for a layered look. I find these necklaces appealing because they blend my love of crochet with my bead infatuation. Plus, they are super simple to make. Step 2: Make a loop and chain about 10 stitches. 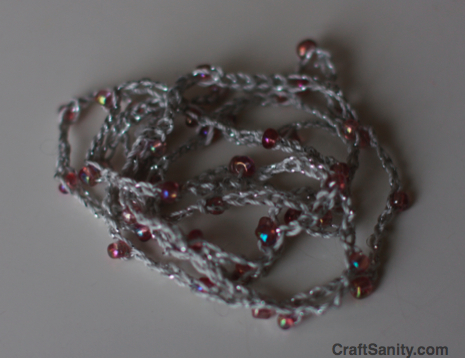 Slide a bead up to the last stitch you made and stitch it in place with another chain stitch. 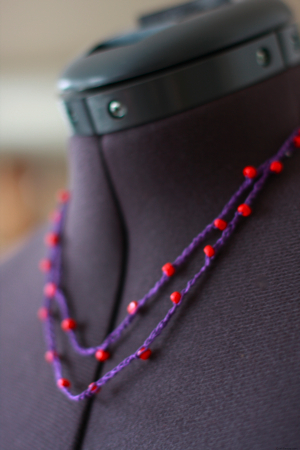 Continue adding beads like this about every 10 or 15 stitches until your necklace reaches the desired length. 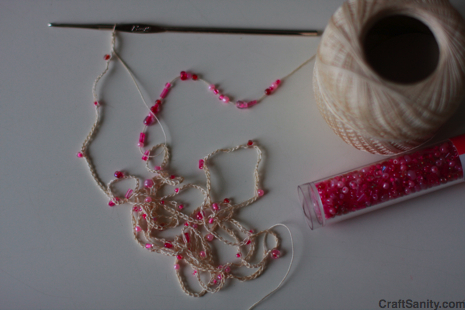 Then slip stitch into the first stitch to connect the beginning and end of chain and form a necklace. Weave in the ends and enjoy! * A special note to parents looking to try this project with kids… Try using worsted weight yarn, a size “G” hook and plastic pony beads. Another alternative is to skip the hook altogether and crochet the chain with your fingers as shown in the video below. Let me know if you have any questions. And feel free to comment about what you’ve made with simple crochet chains. I’d love to hear your ideas. Oh my goodness! an amazing write-up dude. Thank you Even so I am experiencing concern with ur rss . Don’t know why Unable to subscribe to it. Is there anybody obtaining identical rss trouble? Any one who knows kindly respond.